Just as the Miles Franklin Blog believes it of paramount importance to discuss the single most important variable in today’s “markets” – i.e., the government/Central bank manipulation utilized to mask a collapsing economy, and enrich “1%” at the expense of all others; we feel equally compelled to dissect the cooked economic data utilized to justify said manipulations and propagandize the economic state of the union. Generally speaking, “all economic data are lies.” However, politically speaking; as well as in the eyes of the Federal Reserve, whose “dual mandate” relates to price stability (LOL) and employment maximization, inflation and employment data is particularly fraudulent. Thus, reports like suppressed CPI inflation and goosed NFP employment reports require particularly vigilant scrutiny; especially for the benefit of Precious Metal holders, as publication of these reports have served as Cartel “key attack events” for at least the 13 years I’ve been in the sector. As noted in yesterday’s Audioblog – and every pre-NFP commentary I’ve ever written or orated – any headline number “good news” would be either a flat out lie or a completely transparent, easily refutable “truth bending” exercise. As it turns out, today’s report had far more bad news than good. And as for said “good,” even a modestly intelligent ten-year old wouldn’t be fooled by what the BLS, or Bureau of Labor Statistics, attempted to propagandize. Like, for instance, its claim that April witnessed the lowest unemployment rate since May 2008. Honestly, it’s difficult to even write such drivel without laughing; knowing full well the real unemployment rate is closer to the 1930s Depression highs. When, by the way, job quality was far better than today. In fact, not only was today’s data horrible, but predictable in nearly every aspect. To wit, after 13 years in the Precious Metal sector, spotting Cartel “signals” has become as easy as shooting fish in a barrel. To that end, when I saw the HUI mining index utterly annihilated Wednesday despite gold and silver closing essentially unchanged, I could not have been more confident of a Thursday morning paper raid. Likewise, when I saw the HUI close up yesterday afternoon – despite gold and silver down smashed significantly, I was equally confident today’s NFP number would be “bad” enough to enable a PM price rally. Not that “good” and “bad” have much meaning in fabricated economic reports. However, from the perspective of Precious Metal prices, “worse than expected” NFP numbers typically means gold and silver rallies; even if blatantly capped, as today. To that end, having witnessed hundreds of NFP reports, I’ve learned essentially every manipulative trick in the BLS’ book; such as “adjusting” the data to enable “better than expected” reports when the ADP employment report, released two days earlier, suggests otherwise – and vice versa. Or reporting “better than expected” NFP results when all other economic data contradicts such an assertion – and vice versa. To that end, the Cartel has become so transparent in its daily machinations – particularly around said “key attack events” – you can nearly set a clock to them; as I do each morning, when my “feeling” as to where gold will be when I wake up is more often than not dead on. Regarding this particular NFP report, I was extremely interested in what lies the BLS – in co-operation with its partners in the White House, the Federal Reserve, and on Wall Street, would come up with; as given the “Tectonic Market Shifts” I described yesterday – featuring surging global interest rates amidst an unrelenting tsunami of weak economic data – it would have been particularly dangerous to try and portray a “stronger than expected” U.S. economy; which subsequently, could stoke fears of an imminent, albeit mythical, Fed rate hike. Not to mention, economic data has been so bad lately – such as this morning’s publication of dramatically weaker than expected wholesale sales, depicting the largest wholesale sales decline – and inventory build – since November 2008 – it would be difficult for even the most government sympathizer to believe such a preposterous lie. Heck, even Goldman Sachs itself – who essentially runs the government, and leads its economic cheerleading efforts, espoused this morning that not just for the short-term, but years to come, U.S. auto sales are likely to be dramatically lower than today’s sub-prime financed bubble levels. And this, on the heels of its forecast that the horrific crude oil fundamentals I have noted for some time will inevitably push WTI crude below $40/bbl. When the report hit the tape at 8:30 AM EST, the BS BLS certainly didn’t disappoint – in producing yet another farce of an economic report, on all imaginable levels. To wit, despite the litany of horrific economic data throughout April – including countless reports of declining employment; not to mention, Wednesday’s much lower than expected ADP report, the BLS managed to fabricate 223,000 April jobs, just above the 220,000 “consensus estimate.” However, last month’s horrific March result – of just 126,000 “jobs” created – was dramatically reduced, to just 85,000. And whilst the “official” unemployment rate ticked down from 5.5% to 5.4%, the labor participation rate barely budged from its 38-year low, as the number of Americans no longer in the labor force – ironically, no longer considered “unemployed” – surged to a record 93.2 million. Better yet, the usual litany of horrific internals littered the report; starting with the fact that despite U.S. small business “birth” at a multi-decade low; and “death” at a multi-decade high; 213,000 “birth/death” job additions were included in the 223,000 overall job gain. Moreover, the number of full-time jobs actually plunged by 252,000 during April; as opposed to part-time jobs, which in today’s “new employment paradigm,” represent the miserable labor experience of the majority of incremental workers. Yes, in line with the secular trend we see month after month, part-time jobs – none paying benefits, and many of the minimum wage variety – surged by 437,000; perhaps in many cases, double or triple counting people that need multiple jobs to pay the bills. Which is probably why it was reported this week that the fourth quarter of 2014 and first quarter of 2015 represented the first sequential quarters of negative productivity growth in 22 years. And the hits kept coming; as again, per a secular trend that will only accelerate as the Baby Boomers age, without enough savings to retire to retire on; ALL of April’s new jobs were in the 55+ category – meaning all other categories, cumulatively, were negative. And don’t forget the wage growth the Fed so desperately desires; which miserably disappointed – as not only did April wage growth come in at a pathetic +0.1%, but March was revised from +0.3% to +0.2%. Last but not least, the BLS yet again ignored the horrifying surge in announced oilfield layoffs – which just yesterday, the Challenger job cut report highlighted in spades. Yes, despite the massive job cuts recently announced in the oil patch – not just in oil and oil service companies, but countless other ancillary businesses – the BLS deemed that just 3,000 energy related jobs were lost in April. No, I’m really not making this up. The U.S. government actually publishes this drivel, and expects the world to believe it – so long as the PPT, Fed, ESF, and gold Cartel can keep “Economic Mother Nature,” who always wins in the long-term, at bay. Anyhow, I was at the gym this morning when the NFP number came out; as always, venting my perpetual angst at the Stair-climber’s top speed. On one of the public TV’s, CNBC always plays; as if no one has informed gym management that the days of average Joe’s and Jane’s having 24/7 interest in the stock market ended 16 years ago. Across the screen, the word’s “Goldilocks Report?” flashed; yet again, using one of Wall Street’s shallowest, most ambiguous propaganda phrases to suggest the rigged data was just “hot” and “cold” enough to enable stocks and bonds to continue rising. However, per the above description – as well as the contents of all NFP reports, the data was unequivocally horrible. And if not for the machinations of the various manipulation operatives, “dollar-priced gold” – and silver – would be at all-time highs, and stocks and bonds at historical lows. Which of course, at least in real terms, will eventually occur, no matter how hard TPTB try to avert the “unstoppable tsunami of reality” with market manipulation. I mean, the only way this could ever be considered a “Goldilocks” report is if it’s in some type of warped Twilight Zone version; where the porridge Goldilocks eats is neither hot nor cold, but poisoned. Pig-like reports like today’s – which even the world’s best book cookers can’t successfully dress up with “lipstick” – emphasize just how badly the so-called “global economic leader” is doing. With each passing day, month, and year, it becomes more and more obvious – to more and more people – that history’s largest fiat Ponzi scheme is in its death throes. This is why Precious Metals demand will relentlessly – and eventually, parabolically – increase, in a “peak gold” environment with no hope of supply growth for years, if not decades. Remember, it will be a lack of gold and silver supply – as we saw in 2008 -that will ultimately prove the Cartel’s undoing; which is why you must secure yours before it’s too late. Andy, you are by far the very best out there. We rely heavily on all of your writings, podcasts, interviews. As much as I hate what it going on, I’d rather KNOW what is going on. You are my absolute first go to. (and Bill) Thank you, so very much. It’s for people like you that I enjoy writing (and talking) so much! Yes you can put any amount of lipstick you like on a pig but it doesn’t change the fact that it is……. still just a pig. Real unemployment in the US is identical to what it was at the height of the great depression. I regard food stamp statistics as another key indicator as to the state of the economy and they run at 6%. In the absence of definitive statistical data as to the peak numbers of people joining the soup queues I will hazard a guess that they would have been remarkably similar in proportion to their modern day equivalent i.e. food stamps. Andy, the other thing I constantly bang on about is the ludicrous private ownership model of the Fed and the fact that as long as this system persists, the US economy can go in one direction only, and that is to hell in a handbag. Any financial reform of any sort is of no consequences as long as the Fed persists in its present form. My question to you is…. Do you agree with my previous statement? I fully understand that this is a very dangerous question and that for you own safety you may choose not to answer it. In the Weimar republic I believe the situation was quite similar. Leading up to WW2 and the holocaust these sorts of questions were extremely dangerous to ask. However sooner or later the situation has to be addressed otherwise the complete collapse of the nation is absolutely guaranteed. The fundamental cause is so moronically simple it makes the whole chaotic financial system in essence absolutely farcical. Diagnosis is one thing a fix is another! We are at Depression Era inflation, with much lower job quality. There is no turning back, not until the system collapses and is reborn. For your own safety you didn’t answer my question. Nothing to do with safety. I just have so much band width to go into greater detail on topics I’ve already written reams on – and will continue to do so. Regarding the Labor Participation Rate and the 93 million Americans who are not in the labor force, the 93 million includes full-time students, housewives and retired people. There are tens of millions of full-time students who should not be working. They should be getting an education. Should 16 year old school girls be out there working full-time? There are an estimated 10-20 million women (housewives) who stay-at-home and take care of multiple people such as a husband, children or an elderly parent. They should not be out there working. They have a full-time job as it is. Should they abandon their families just to make money? And if some older person wants to retire a little early that is up to him or her. They should not be working if they choose to retire after more than forty years. But yet now some people are saying that the unemployment rate is really over 30, 40 or even 50% because all those not in the labor force are eligible for work because of their age and since they are not working they should also be included in the unemployment number. While these people are eligible for full-time work they are NOT AVAILABLE FOR FULL-TIME WORK. Many of them are not looking for a full-time job simply because they do not want one nor should they get one. That was not how the unemployment rate was calculated in the past decades and no one complained. They did not include school students, housewives and retired people in the unemployment number. Some of these people criticize the stats from the government and say they are bogus when their own numbers are even more bogus. Personally I would look at something like the U6 number as being more closer to what the unemployment rate really is. According to Bill Holter, ShadowStats has two unemployment numbers, a 23% and something like a 17% number. 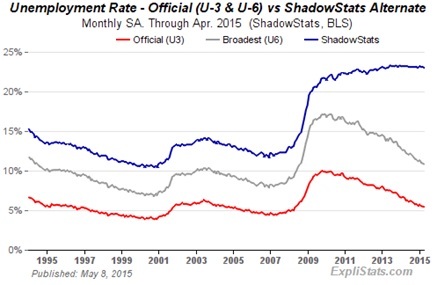 I could be wrong be I think ShadowStats includes people who may be considered more underemployed. Thanks Andy and I would appreciate your comments. Just Google Shadow Stats alternative employment, and you’ll see the real unemployment number; close to the Depression highs, but with much lower job quality now. Did Greece just pull a fast one on the IMF. This news about where the payment money came from is indicative of what Andy and Bill have said for months. They didn’t pull anything on anyone. They simply made themselves more broke, delayed the inevitable for a few weeks, and pissed off the IMF – i.e., part of the “Troika” (sorry, the “Institutions”) it needs for the $50 billion bailout it needs (and not only won’t get, but the Greek people would revolt over). Ironically, the Euro is higher against the dollar – showing just how useless currencies are, and how broken the entire system has begun. Yes Andy… all this does is confirm how the financial system no longer has any amount of credibility left within it. Agreed, and about to get a lot messier.